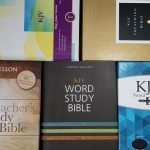 The KJV TakeNote Bible (also available in a chocolate brown NKJV ), a new wide-margin journaling Bible from Thomas Nelson, takes the grand old King James version and places it into a widely accessible journaling format for note taker’s and Bible lover’s. Though Crossway’s 2006 journaling Bible wasn’t the first on the scene (see Tyndale’s out of print Notemaker’s Bible ) it made a splash in the Bible publishing world that took wide-margins further into the mainstream and introduced a format that appealed to avid note maker’s but didn’t intimidate the occasional scribbler. 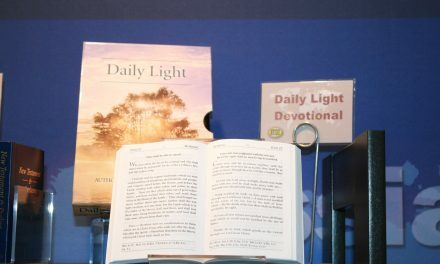 Thomas Nelson applied the philosophy behind the user friendly wide margin format and added a few improvements to make their TakeNote editions, which maximize current trends and advancements in Bible publishing. The most immediately noticeable feature of the Bible is its incredibly soft and flexible imitation leather cover. This is by far the best imitation leather cover I’ve handled. It’s both softer and more flexible than Crossway’s TruTone and features a handsome pebble grain finish. I was surprised by the suppleness, which easily performs the yoga position and allows the Bible to bend easily. It’s actually more supple than some of the goatskin Bibles I’ve handled, and while this may not be a must for every reader it’s a great benefit when you have an edition that’s 7.5 inches wide and certainly challenges most of the journaling Bibles out there, which tend to be hardbacks. 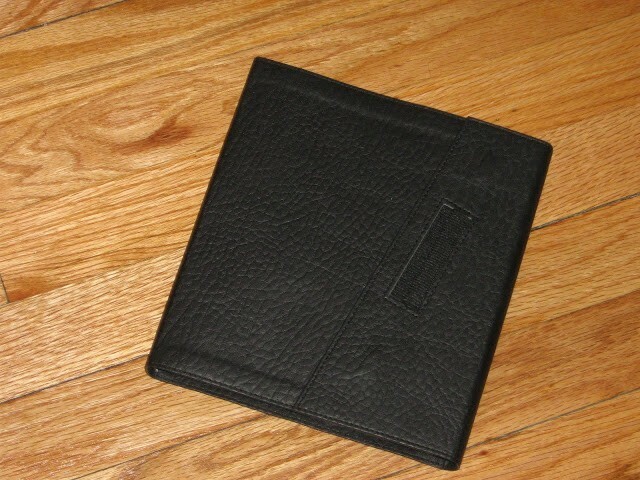 The cover features a magnetic flap which serves as a protective enclosure for the page edges (which are not gilt) and seems both efficient and durable. Another added feature is an elastic pen holder. The pen holder will probably divide consumers, who will either find it a handy and much needed place for their special Bible pen or a tacky nuisance, ruining any chance the Bible has at class. I tend to be of the first persuasion, primarily because I’m always out of sorts when I misplace my special Pigma Micron Bible pen which is color coded to each individual Bible, but also secondarily because this edition is not meant to be a high class competitor with goatskin editions. It’s an edition that majors on functionality, and that should be the first concern for any Bible lover. The edition handles the contortions well; only time will tell if the glued binding holds up to the strain of being folded over in such a manner. 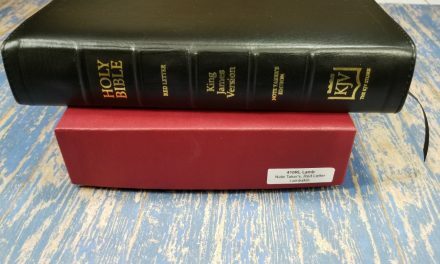 The layout manages to stay clean and uncluttered without a cramped or minimalist look, but this results in a Bible over 15 inches wide when laid open which may make the flexibility necessary for those who choose to curl the cover behind the back. Any wide-margin Bible layout includes a number of compromises and the balance is rarely perfect for everyone. In this case, Nelson has achieved great success in producing a readable layout with suitably wide margins for thorough, though perhaps not extensive, note taking. The font size is one feature that most find lacking in these editions and the TakeNote edition runs parallel with its relative editions with about a 7.5 font. What the TakeNote version adds is a comprehensive center column reference system that features alternate and literal translations for certain words, as well as textual and language notes. This center column reference makes this the only reference journaling Bible I know of and explains the square shaped and size of the Bible (8.125in x 7.5in). The note-taking margin is a little over 2 inches, but the lines only extend about 1.5 inches. My preference is margins without lines, which frees me to create arrows, pointers diagrams etc. However, writing evenly is a concern for some. As a whole the layout is a success, there are no jarringly neglected features and it contains the content in an orderly fashion without clutter. Many would argue that a single column setting with side references would be ideal, but the traditional column setting is still a must for many, and it’s achieved here as gracefully as possible. One characteristic I’m not a fan of is the thinness of the spine. I appreciate a thick volume and have never been pleased with thinline or ultraslim editions. The quality of the paper and optimizing the layout should far outweigh any concern for a thin spine. A thicker spine fills up the palm and is only suitable for a book as large as the Bible. This edition probably has the same thickness of an ultraslim edition and this unfortunately means thinner paper with less opacity which is greatly detrimental to any Bible you’re using for note taking. Compromises between construction and layout must be made, but I would love to see publishers opt for a thicker spine, allowing heavier paper, larger print and larger margins. This Bible features red letter text, which is an appropriately dark shade of crimson. 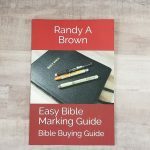 In addition to the cross references, the edition offers a fair sized concordance which includes proper names (a rare treat these days) and a good set of Bible maps.At the back there is also a cardboard pocket designed for holding, notes etc. and would probably end up holding bulletins and offering money for most people. Modeled after Moleskine design this feature is an apt edition, considering most people tend to tuck bulletins, church announcements, missionary cards, prayer lists etc. into their Bible in various places. 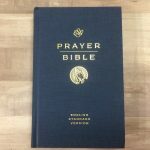 The KJV TakeNote Bible is a welcome addition to user friendly, feature-packed wide margin Bibles designed for the mainstream. Thomas Nelson has included a number of improvements in the design and has surrounded a well handled layout with useful study tools, practical features and a beautiful, high quality imitation leather. Only time and use will test the durability and endurance of the construction, but the design evidences careful and creative thought. While I might prefer a thicker spine, heavier paper, larger print and a smyth sewn binding rather than glued, this is a welcome edition with many strengths, and I would not hesitate to recommend it to KJV lovers and note taker’s alike. My thanks to Thomas Nelson who provided a free review copy. I was not required to give a positive review only an honest review. This review was very helpful. This is exactly what I am looking for. Unfortunately, I am not able to find it online anywhere. Do you know if this Bible is still in print, and if so, where it may be purchased? Hi Christine. Unfortunately it’s no longer in print. I’ve seen a few on ebay, but they’re very expensive. I’d like to see this one come back. Thank you Randy. I still have had no luck finding a Bible that will suit my needs. Hi Jordan. I’d love to see this one come back.